Those who were lucky enough to attend WonderCon 2014 on Easter weekend had the opportunity to track down Dreamworks employees and score VIP passes to see the first hour of the much anticipated film, “How to Train Your Dragon 2,” directed by Dean DeBlois. Deblois attended the 20th Century Fox panel on day two of the convention along with actor Jay Baruchel, who voiced character Hiccup in the film. The two, along with their fellow panelists, were overwhelmed with the reaction they got from the arena of people. 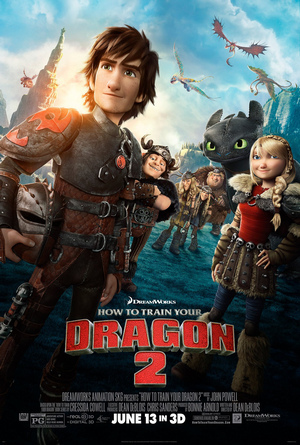 The “How to Train Your Dragon” trilogy has a much larger fan base than the panelists were aware of, as evidenced by the number of people in attendance at the screening. However, not everyone who attended the panel was able to track down VIP passes to see the movie. And those who were had to leave the convention and make their way over to the AMC Theater in Downtown Disney. DeBlois and Baruchel informed the theater that the film was incomplete, with no special effects in place and a score that included pieces from well known films such as “Lord of the Rings” and “Pirates of the Caribbean,” rather than the expected music from composer John Powell. One of the best aspects of “How to Train Your Dragon 2” was the character development we already see in the first five minutes. The film takes place five years in the future from where we left off at the end of the first film, and Hiccup is now 20 years old. This means that his relationship with dragon rider Astrid has been going strong for 5 years as well. Even Stoic, Hiccup’s father and chief of Berk, is making jabs to Astrid about her being his future daughter in law. The relationship between Hiccup and Astrid is one of the most well done established relationships in an animated movie. Without being overly romantic, and maintaining a kid-friendly theme, the relationship is still very healthy and showcases good communication. It is clear that the two dragon riders are still pushing each other to do better, and maintain the sense of individuality we love from the first film. This was great to see in a film aimed toward children, and will hopefully be a trendsetter and model for other animation studios. A much anticipated plot point is the return of Valka, Hiccup’s long lost mother. Without spoiling too much, what I love about her character is the obvious awkwardness that is expected from someone that has been living with dragons for 20 years. It would have been unrealistic for her to be too good at communicating with humans, but it wouldn’t have been enjoyable to watch a character that’s practically an animal. Valka’s character has a great balance of the mother and wife she once was, and the mother of dragons she has become. The film writers did an amazing job and creating a believable character and pace at which she becomes more comfortable with Hiccup and Stoic, without spending too much film time focused on it. Since the film is only 92 minutes long in its entirety, the first hour lead the audience all the way up to the climax of the film, leaving fans desperate for more. This screening, obviously a marketing ploy to create hype around the movie, just made the film even more anticipated than it already was. Those with high standards for the film have every right to keep them. That’s because “How To Train Your Dragon 2” hits theaters June 13, and will meet those standards with flying colors, and flying dragons!